Dooley was an unmitigated disaster with incredible hair. Tennessee is losing ground to Vanderbilt. VANDERBILT. In his tenure Dooley coached from a wheelchair, a press box, a stool and with a cain. The one consistency was not coaching well. Dooley can go back to doing whatever he was doing before he was mismanaging games. We'd have to go back a long way to figure out what that was. Butch Jones has won everywhere he's been. 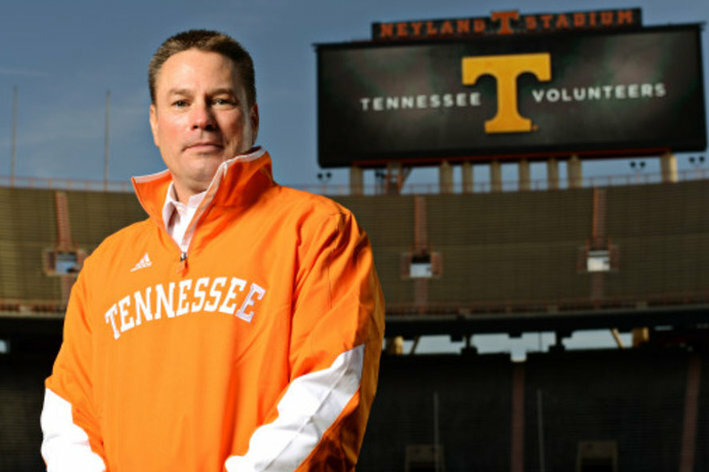 Tennessee and the SEC is a different animal but Jones can get the Vols competitive in the SEC East. It will take some time. Florida is going to be better, South Caroline is always tough, Georgia could be a top 5 team, and Vandy is up and coming with James Franklin. Dooley didn't leave the cupboard bare, but Jones will have to teach his players to play football. This may take time, but Jones has done this before. They'll be a tough out while they build up to a SEC East contender. Time may be the one thing Butch ain't got. The stadium in Knoxville seats somewhere around a million people. Last year people stayed away in droves. He'll need to rebuild confidence with the masses quickly. Auburn were the national champions three years ago. Remember that? I do. Cam Newton had his Cam Juice, Chizik was a viable head coach. That was a long time ago. The SEC has moved on and the Cammy Cam ain't coming through that door. Chizik couldn't settle on a quarterback which was bad, his defenses started to hemorrhage points which was worse. Gene won a title and the question remains, was he a good coach? Gus has gone from high school coach to SEC head coach in under a decade. In the interim he's been head coach at Arkansas State, coordinated a national championship offense, butted philosophies with Houston Nutt at Arkansas and watched his wife run her mouth about company business. Gus is still an offensive genius who really just needs to be left alone to run it. The key for Gus will be to hire a defensive coordinator who can stop people. They'll be entertaining. Ole Miss, A&M and Mississippi State will be as well. Those games should look very Big 12-ish. LSU and Alabama are another story. When you're the head ball coach at Auburn you don't need to look far for the measuring stick. 'Bama is just down the road to remind you off all the things you aren't. Malzahn won't put too much fear into Saban but he will cause the rest of the division to take notice. Gus better start recruiting because he's not making up any kind of gap with his current class. Tommy wanted out of Lubbock as soon as he arrived three years ago. He did so by going to Cincinnati, a Big East school. Bawhaaahaaaaahaaa! Good luck with that Tommy! You will certainly dominate the Big East. Watch out of Temple and...and...I can't name another Big East School, Oh ya, Tulane and Memphis. Hope it was worth it. Kingsbury was going to get a head job somewhere after his stops at A&M and Houston. Once the Tech job opened it was like two super magnets pulling unavoidably to each other. Kliff is Simba returning home to the Prideland after Scar has scorched it. I have a four year old. 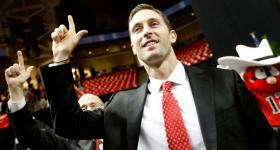 There will be an extended honeymoon period for Kliff. They LUV him in Lubbock. He's a swell looking fella who can coach offensive football. The key, like Malzahn, will be can he bring in a defensive staff to get that crucial stop when it's 58-57 in the fourth quarter. I like the hire for a number of reasons one being it may serve to stem some of the ill will from the Leach firing a few years back. Also Kliff is too young to be scared of taking on the Big 12 elite whether on the field or the recruiting trail. Arkansas was a train wreck last year. Petrino took a motorcycle ride with a leggy blonde that wasn't his wife, got in a wreck, then tried to cover up the leggy blonde part. He got canned and landed, not on his face for the first time in a bit, at Western Kentucky where he will lie in wait for Spurrier to retire, Les Miles to finally admit he has no idea what's going on, or Mark Richt to go full time evangelist. Arky was a top 10 team heading into last year and the interim John L. Smith hire turned out to be a disaster. John L. took a division II job. Good for him. This one is curious. Bielema is fresh off his third straight Rose Bowl squad at Wisconsin with three different quarterbacks. He had cheese fed large men ready to pave the way for his road grader offense and a Big 10 that is geographically bigger, though not better by quality. Bret may have seen the writing on the wall with Urban Meyer at Ohio State and thought he'd reached his pinnacle in Madison. Arky is a good job with recruiting inroads in Texas, Louisiana, and of course Arkansas. Bielema will have a bigger budget for assistants and there is talent on the roster despite last season's results. Bret is a good coach who's won at a big time level. The bad news is he's jumping into the most competitive conference/division in the country. As someone said regarding the hire, Bielema will attempt to out Alabama Alabama. I think Bret's smarter than that, but he will base his success on defense and running to set up the pass. The schedule will be brutal but some would argue that his resources at Arkansas are greater than anything he had at Wisconsin. Serious question, has anyone seen Chip Kelly and Brian Kelly in the same room? Suspicious. Kelly shocked everyone by turning the NFL down, then shocked everyone again by going to the NFL. All this in a span of two weeks. Chip continued to build the juggernaut in Eugene. He made a National Championship game, BCS bowls, won PAC 12 titles, and made care about matte finishes on helmet and the Belloti font. You can argue all he has left to accomplish is the BCS title but he's done a ton at Oregon. Good luck with Nick Foles. Seriously. It seemed imperative that Oregon maintain offensive continuity, and they did so by promoting Offensive Coordinator Helfrich. Though Kelly had a clear system in place when he arrived in Eugene, Helfrich is just as responsible as anyone for the Ducks offensive success. The Ducks will be a top 5 team entering the 2013 season. That's as much about what is returning as it is who's coaching it. Helfrich is a great fit for the status quo. Status quo is plenty good enough for Oregon. Phil Knight continues to make the Ducks his personal project and kids love the facilities and uniforms. (Yes, I am confused by the second part.) If Helfrich can continue the recruiting momentum of Kelly and make the transition from coordinator to head coach, the Ducks will continue to be very good. Not to sound like a broken record, but success will rely on the defensive coordinator. Does Nick Aliotti stick around or do they go in a different direction? Why are we talking UTEP football? Because it's part of my dream conference (details to come.) Besides UTEP is a Texas school and therefore relevant. The Miners made a big splash by resusitating the career of Mike Price. After his Alabama stint, (strip clubs Mike? Really?) Price wore the scarlet letter and was thankful to get his chance in El Paso. Here's a little know fact, they are Miner Crazy in El Paso they average over 30k per game and next year THEY'RE SELLING BEER! Huzzah! They haven't even been that good and they've had solid attendance. Mike retired and the Miners looked for someone to keep building in El Paso. Who? Sean Kugler. He was the offensive line coach of the Steelers, this will be his third stint in El Paso, having played for the Miners, coached O-line for the Miners, and now Head Coach. Kugler said this was the one job he aspired to. What about the Texas job? Or the Packers? Besides the Steelers Kugler has coached for both the Lions and Bills. He has a ton of pro experience and some college experience, none as a head coach. UTEP's schedule is in flux because no one really knows who's in Conference USA. They do have New Mexico, New Mexico State, Texas A&M, and Colorado State in non-conference action. Kugler has to recruit to El Paso which isn't easy and he has to be careful to avoid oversigning JC players and make inroads into Texas High Schools. There are plenty of kids who can play in Texas, UTEP has to convince them to go El Paso instead of out of state non AQ schools. This is a tough job for a first time head coach. Posted on January 24, 2013 by The Roundup.